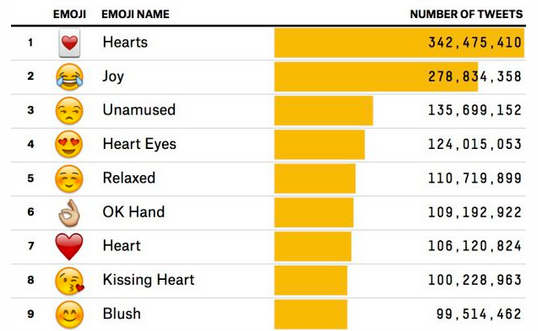 It's no secret that people love emoji. Facebook introduced 'Reactions' in part as a response to the way in which people were already using those little smiley faced images on their platform, while Instagram released a report last year which showed that nearly half of all text on the platform now contains emoji in some form. Twitter, too, is keen to get in on the emoji action - and really, of all the platforms, Twitter's format probably makes it best suited to emoji. The 140-character limit requires more creativity in how you communicate, so anything that can make it easier to convey your meaning in fewer words is beneficial - which is exactly what emoji facilitate. Twitter users' interest in emoji is reflected in the numbers - the platform recently reported that More than 110 billion emoji have been tweeted since 2014, and, like Facebook's Reactions, Twitter's made its own changes to work with this trend, most notably in the switch from a 'star' to a 'heart' icon for 'favorite' last year. And again, part of the motivation behind that was the fact that the heart was already one of the most used emoji on the platform. Given this, and given Twitter's need to get more people interested and involved with the platform, today's announcement comes as little surprise. From now on, you'll be able to add emoji-like stickers to your photos when you post them to Twitter via your mobile device. Of course, people have been able to do similar on other platforms for some time - on Snapchat, you can even put stickers on your video posts and have them move and scale as the video plays. Twitter's not that far along the emoji/reality mash-up path as yet, but today's announcement does put Twitter more in line with similar use cases and audience interests. "Soon, you can browse our rotating sets of stickers to join in on real-time conversations, and select from the library of hundreds of accessories, emoji, and props to make your photos more fun. Use them to share what you're doing or how you're feeling, to show support for a cause, or to just add some flair. You can use multiple stickers on a photo, resize and rotate them, and place them anywhere on your picture." The mention of 'show support for a cause' immediately suggests that Twitter will also be hoping to use this as an advertising offering at some stage. Not for causes, necessarily, but you can imagine that these stickers - particularly if they see high use - would be a perfect opportunity for, say, the producers of the upcoming 'Suicide Squad' film to add in their own character sticker set, enabling users to promote the film on their behalf, and have fun doing it. This is similar to how Snapchat uses their Lenses, and what TechCrunch's Josh Constine calls "Sponsored Creation Tools", providing fun, interactive promotion options that users actually want to play with. This may also provide Twitter with another way to target users of certain images - Twitter, you may recall, recently announced that advertisers will now be able to use emoji as an ad targeting option. If you want to advertise your new pizza shop, for example, you could target users who regularly use the pizza emoji and who live within your region. Emoji targeting seems a little crazy at first, but when you look into it, it actually makes good sense. So will Twitter's photo stickers work and get more people tweeting and more engaged with tweets? There's obviously no way to know, but Twitter will be hoping that users will try them out over Summer and will grow to love the new ways to express themselves via the cartoon style images. Part of the problem, however, is that Twitter may already be too far behind the times on this. As noted, Snapchat's already moved onto video stickers, while Facebook - through which you can also already add photo stickers in the same way as Twitter's proposing - is just about to unload video face masks for Live, taking their image-altering capacity to the next level. With the functionality on other platforms getting more complex, and more interesting, has Twitter already missed the boat? The ability to add stickers to your photos will be rolling out "over the next few weeks" for both iOS and Android, according to Twitter. Users will also be able to view and click stickers on Twitter.com.